Renowned Edmonton playwright Stewart Lemoine teams up with Edmonton Opera to create a brand-new production with a brand-new take on Gilbert and Sullivan. Join Little Buttercup, Ralph, Josephine, Sir Joseph and the sailors of the high seas in a comedy that sings the songs of love and silliness, and pokes fun at society too: British satire at its best! Sharon is an Explorer’s Club member which means that first and foremost, our tickets were cheaper! We also got free pizza and beer during the intermission. Before the show we went to a thirty minute “introduction to the opera” session where we learned a little about the plot in Pinafore and some of the history behind it. That was really helpful, and definitely interesting. Only one cast member, Monica Huisman who played Josephine, was what I would call “over the top opera.” I couldn’t understand a word she was singing, and her voice was incredibly shrill. My favorite was definitely Jeff Haslam who played the crazy Sir Joseph Porter. 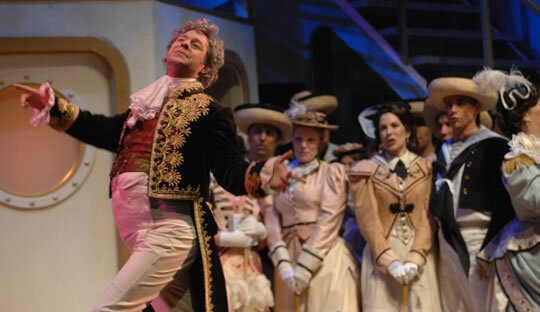 I’ve seen Haslam act many times here in Edmonton, and he was excellent again in the opera. He stole the show, without a doubt. I’m sure opera afficionados would gasp at the idea of subtitles, pizza, and beer, but it made the experience much more enjoyable for a first-timer like myself. Opera is kind of like a musical that you can’t understand, and I’m not such a fan of musicals in the first place. Just as funny now as it was a hundred years ago! That’s probably why Pinafore is still popular – it’s timeless entertainment all around.